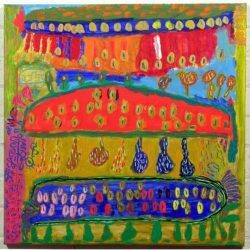 Robert Brown is an abstract painter whose work is characterised by bold and vibrant use of colour and a spontaneous layering of imagery. Working on large sheets of paper and canvas, Brown draws inspiration from found images of landscapes, reinterpreting what he sees with great freedom to create bright, wild compositions, balancing highly concentrated pattern with quiet space. 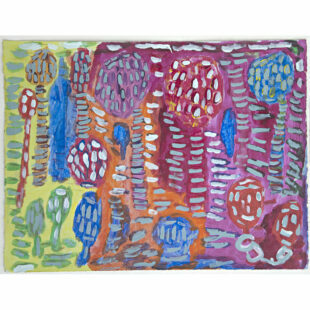 Robert Brown has worked in the Arts Project Australia studio since 2001, and presented his first solo exhibition at Arts Project Australia in 2003. 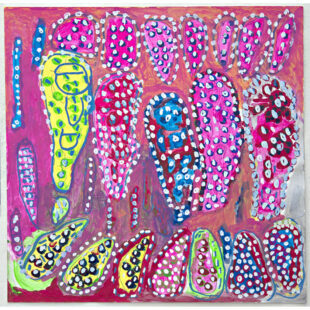 He has also presented in numerous group exhibitions including Signature Style, Arts Project Australia Gallery, Melbourne, 2016, Home, Arts Centre Melbourne, 2015, Colour My World, Arts Project Australia, Melbourne, 2011, Detour, Northcote Town Hall, Melbourne, 2008, and Connected 07, The Atrium, Federation Square, Melbourne 2007.